The Mare Nostrum, the most mysterious and rarest of all Panerai models, returns thanks to an exceptional re-edition that is absolutely faithful to the main characteristics of this impressive chronograph: case, measurements, dial and production processes. The result is a large watch with big historical appeal and big visual impact. Mare Nostrum is the chronograph that Officine Panerai supplied to the Italian Navy in 1943 as standard issue for officers on deck. The ongoing historical events put an end to any possible development of this model, of which only a very few prototypes were produced – almost certainly three in total – of which first all trace and then all relative documentation was lost, following the flood that hit Florence in 1966. Discovery by Officine Panerai of one of the prototypes, now part of the collections at the Officine Panerai Museum in Florence, enabled creation of a new Mare Nostrum an extraordinary model from a collectors’ point of view, in a single edition of just 99 examples that reproduce the original right down to the smallest detail. The Mare Nostrum – 52 mm has an impressive brushed case in three parts and measuring 52 mm in diameter, like the original. With very strong lugs, it has a tonneau shape, but looks round due to the wide flat bezel with ridged edge on which, just as on the prototype, a fine circular mark stands out, perhaps due to an unfinished process or a reference mark for a subsequent scale engraving. The screw-down back plate has four grooves to assist unscrewing and this too is in brushed steel, but unlike the original, it features a sapphire crystal window through which the movement can be seen. The cylindrical winding and regulating crown, with the words Mare Nostrum engraved on its ridged edge is of the screw-down type and the pump buttons are cylindrical. The watch is guaranteed watertight to 3 bar (about 30 metres), a depth that depended on the historical use of the Mare Nostrum. The two reasons for this were that, firstly, the model was designed for use on ships and not underwater and secondly, at that time it was virtually impossible to make the chronographic buttons on a watch totally waterproof for any length of time. Protected by a 1.6 mm thick anti-reflective sapphire crystal, the dial has a black base and two levels. The outer, upper ring, bears small Arabic numerals, stick hour markers and round minute markers, all coated in luminescent material. 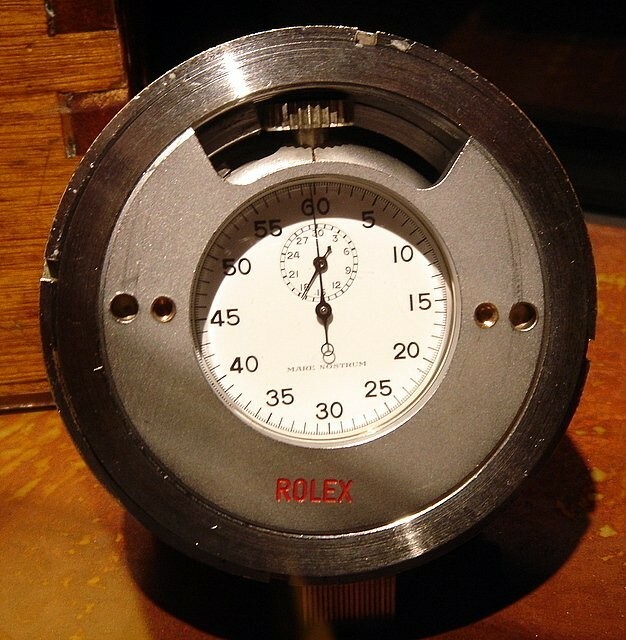 The central one level, over a millimetre lower, bears the names of the brand and model and the two subsidiary dials. On the left the small seconds one, on the right the minute counter, set to 45, as was the norm in those days. The considerable gap between the two layers of the dial gives it unique depth and the chronograph hand, unlike the luminescent hour and minute hands, is blue, just like the prototype. This new edition of the Mare Nostrum uses, like the original, a hand-wound mechanism: OP XXV calibre, deriving from a Minerva calibre that measures 16 ¾ lignes. The balance makes 18,000 alternation an hour, the same as the Angelus movement of the prototype. Fitted with a anti-shock device, the column-wheel movement can easily be seen through the window on the back plate and all the levers are polished with rounded corners. 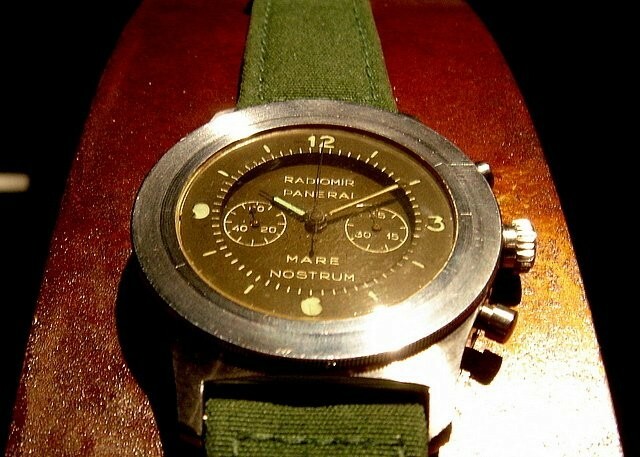 With reference PAM00300, Mare Nostrum – 52 mm even has the same strap colour and material as the original: military green in leather-lined fabric. The buckle however is different, larger and trapezoidal in shape, like all current models by Officine Panerai. Movement : Hand-wound mechanical, exclusive Panerai OP XXV calibre, 12¾ lignes, 22 jewels, monometallic Glucydur® balance, 18,000 alternations/hour, Incabloc® anti-shock device. Swan’s neck regulator. Côtes de Genève decorations on the bridges. Power reserve 55 hours. Functions : Hours, minutes, small seconds, chronograph with two counters. Case : Diameter 52 mm, AISI 316L brushed steel. Winding crown engraved with the inscription Mare Nostrum. Brushed steel push-buttons for the chronograph functions at 2 and 4 o’clock. Dial : Black on two levels with luminous Arabic numerals and hour markers. 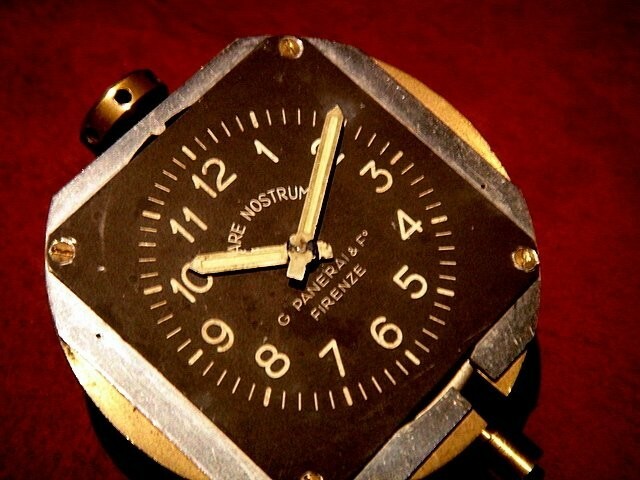 Minute counter at 3 o’clock, small seconds at 9 o’clock, central chronograph hand. Crystal : Sapphire, formed of corundum, 1.6 mm thick. Anti-reflective coating. Water-resistance : 3 bar (30 metres). 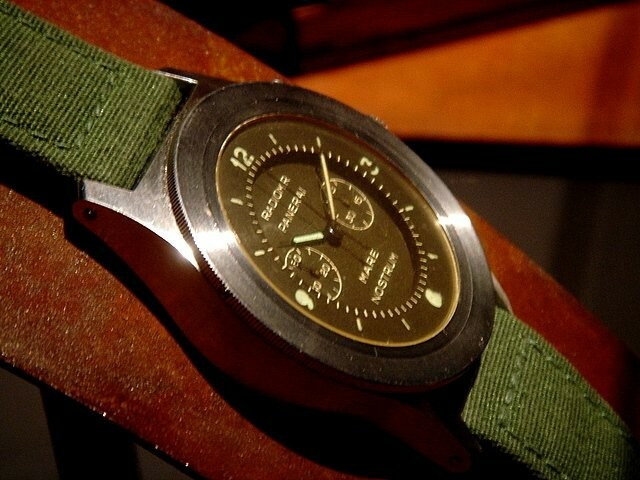 Strap : PANERAI personalised green fabric and leather strap and large-size brushed steel buckle. Last edited by StampeSV4; 24-04-2010 at 17:40. Very nice. Shame they don't do a 44mm version for around 2-3k of the new issue though!